Following on from my earlier blog on how to value a professional services firm, this short blog looks at the concept of a value map and how such a device can be used to frame and develop your business growth agenda. As previously explained in this sister blog post, there are many ways of looking at the topic of where value lies in a professional services business beyond the classic valuation formula. The mix of valuation techniques, generic growth strategies and specific stratagems for professional service firms can be confusing. The following schematic – a value map – seeks to illustrate the interconnections. 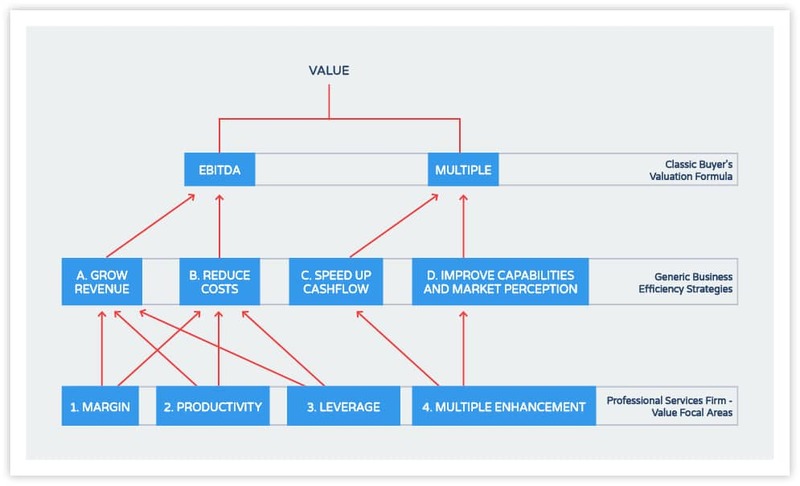 The top layer of this value map simply captures the two components of the classic valuation formula: EBITDA (Earnings before interest tax and depreciation) and your firm’s multiple (you can view this as an assessment of your firm’s inherent future-profit-bearing capabilities and/or attractiveness to a buyer). The middle layer describes simple, generic strategies open to any business. On this layer, A and B are obvious. Box C talks to the efficiency by which working capital moves around your business (the ‘oil’ in the system). By example, the more efficiently you chase down your debtors (client invoices), the less likely you are to require bank overdraft/loan (with interest payment implications) to cover any periods of indebtedness with respect to your own creditors. Your financial control disciplines will be a key factor in any external scrutiny of your business; hence this factor will impact your multiple valuation. Whilst boxes A-C can be gleaned directly from your financial reporting, box D captures the more nuanced, multi-dimensional challenge of building out your firm’s operational capabilities and general attractiveness to others. This is something all business leaders should seek to do even if there is no intent to sell the business in the future – as developing out such aspects will just ensure you have the most efficient, sustainably-profitable operation possible. Further, it will ensure you have the future optionality on a business value realisation moment – things do change in people’s lives – why would you not want that option? By showing this all together, I want to give you a sense of the interconnectedness of all the topics I cover in the Climbing Mount Audacity blog roll. My real focus is on the pragmatic bottom layer of this value map. 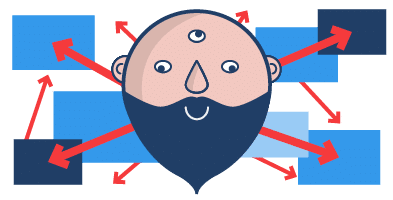 For example, I recently wrote a series of blogs on one of the most critical capability build projects you can embark on: developing a repeatable sales capability in your business. Another blog talks about building out a board as a central component of your organization’s governance. Yet another blog talks about the critical endeavour of building a high-performing team. The 50-page research paper on high-performing teams can be downloaded below. Or, what truly motivates people at work? Future blogs will tackle other such core capability areas. In the coming weeks, however, I want to really focus on profitability: how it is derived in a professional services business and what specific sub-components of profitability (margin, productivity and leverage) you should measure, track and manage. With this value map frame now set, next week’s blog will dive into the detail with respect to how best to grow profit. It will come also with a useful profitability checklist to download. Next week, I will dwell now on how profit is derived – and measured – in a typical professional services firm.